Researchers at New York University Tandon School of Engineering report a new group of unclonable cyber security primitives composed of an economical nanomaterial with the maximum possible level of structural randomness. This could possibly lead to the next generation of electronic hardware security. Randomness is extremely desirable for developing the security primitives that encrypt and accordingly secure computer hardware and data physically, instead of by programming. Assistant Professor of Electrical and Computer Engineering Davood Shahrjerdi and his NYU Tandon team offer the first confirmation of full spatial randomness in atomically thin molybdenum disulfide (MoS2) in a paper published in the ACS Nano journal. The nanomaterial was grown by the researchers in layers, each approximately one million times thinner than a human hair. By changing the thickness of each layer, Shahrjerdi explained, they tweaked the size and type of energy band structure, which in turn influences the material’s properties. “At monolayer thickness, this material has the optical properties of a semiconductor that emits light, but at multilayer, the properties change, and the material no longer emits light. This property is unique to this material,” he said. By tweaking the material growth process, the resulting thin film is speckled with aimlessly occurring regions that alternately discharge or do not discharge light. When exposed to light, this pattern translates into a unique authentication key that could secure hardware components at negligible cost. 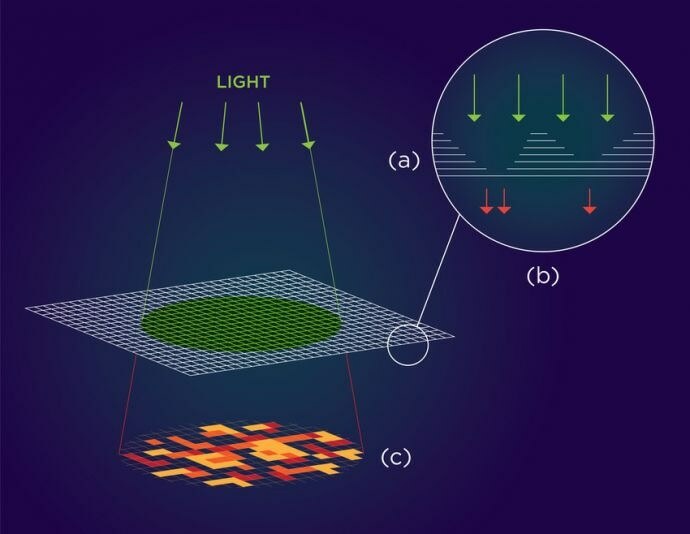 Shahrjerdi said his team was looking at potential applications for what he described as the attractive random light patterns of MoS2 when he recognized it would be very valuable as a cryptographic primitive. This signifies the first physically unclonable security primitive formed using this nanomaterial. Normally embedded in integrated circuits, physically unclonable security primitives protect or validate digital or hardware information. They interact with a stimulus — here, light — to yield a unique response that can serve as a means of authentication or cryptographic key. The research paper titled, “Physically Unclonable Cryptographic Primitives by Chemical Vapor Deposition of Layered MoS2” appears in the journal ACS Nano. Co-authors include NYU Tandon doctoral candidate Abdullah Alharbi and graduate students Darren Armstrong and Somayah Alharbi. The research was supported by the National Science Foundation and the U.S. Army Research Office.